of these first quality bubble pouches. These are are NOT self-seal. 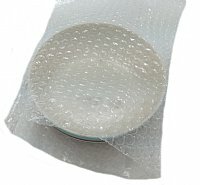 Flush cut pouches (no lip and tape) 3/16" clear bubble cushioning wrap on the outside of the pouch protects and cushions your item. Size refers to usable dimensions.